Applicants have the possibility to make sure that their applications are perfect before submission. Final deadline: 31st August. If your organization is innovative, committed to digital health transformation and based in Europe don’t miss the inDemand Community call! inDemand is looking for 12 European regions interested in innovation in Healthcare. The selected regions will learn how to implement the new model based on a demand-driven, co-creation approach. Throughout the inDemand Community, the regions will benefit from mentoring and a tailored support to skyrocket digital health. Applicants now have a way to make sure that their applications are perfect before submission. 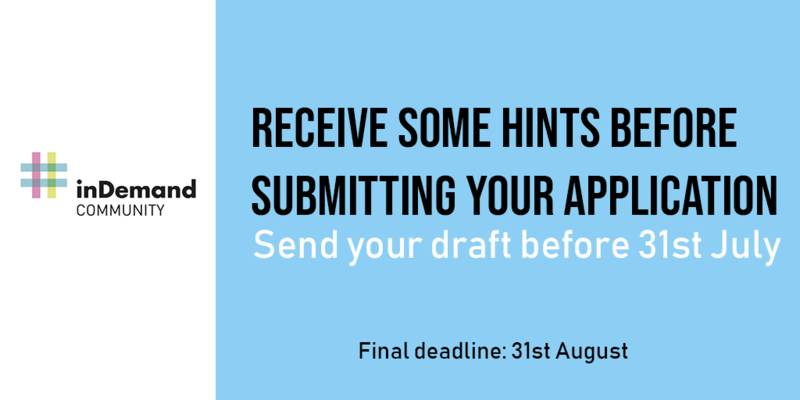 Those who send their applications by 31st July will receive a short feedback about what would need to be improved. “The goal is to assure that we are on the same page. If something needs to be changed, they will still have one month before the final deadline on 31st August”, explains Jorge González, inDemand coordinator. The inDemand project has received funding from the European Union’s Horizon 2020 Research and Innovation Programme.